Atmos clocks keep going for such a long time because they use differences in atmospheric pressure and temperature as their power source. They have a capsule containing a mixture of gaseous and liquid ethyl chloride inside, and the gas expands as the temperature rises and compresses a spiral spring while doing so. If it gets colder again, the gas condenses and the spring slackens. This motion constantly winds the clock. For example, a temperature variation of only one degree Celsius is enough to power the clock for two days. This sounds like a rather futuristic way of making your clock tick, but in fact the first mechanism to employ this technique was created during Shakespeare’s lifetime. A Dutch inventor with the name of Cornelis Drebbel constructed a perpetuum mobile for James I, which was first demonstrated in 1604 and then on display for visitors at Eltham Palace. You can see a picture of it below, which is only a detail from a much larger painting now housed in a museum in Baltimore. By all accounts, Drebbel’s instrument combined two features: first, a self-winding astronomical almanac showing the date and the phases of the moon, and second, a cylindrical ring in which water moved endlessly to and fro. Of course, this mechanism is not really a perpetuum mobile, a machine that never stops, but it would have been considered almost magic in its self-sufficiency. 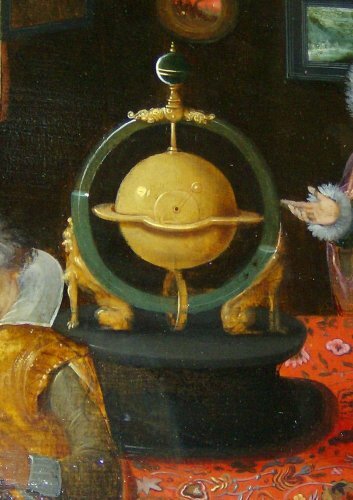 Cornelis Drebbel’s Perpetuum Mobile, detail from Hieronymus Francken the Younger, The Archdukes Albert and Isabella Visiting a Collector’s Cabinet, The Walters Art Museum, Baltimore. This so-called Eltham Perpetuum was a widely talked about object in Jacobean England; Shakespeare’s fellow playwright Ben Jonson mentions it twice in his works. Although Shakespeare does not include this invention, he is thought to have used Drebbel as one of the models for his own magus figure, Prospero, the learned scholar, inventor and magician, who rules the desert island in The Tempest with the help of the magic he has acquired through years of devoted study.